Developed in hospitals, pre-hospital, university and voluntary sectors, the Brayden Pro provides health care professionals with quantitative data driven feedback. 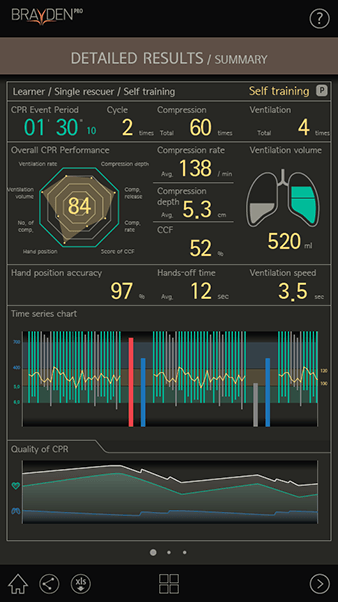 The Brayden Pro sends live data to the Brayden Pro App via Bluetooth to provide real-time feedback of CPR performance – this data can then be reviewed and analysed to improve the quality of CPR performance and provide a numeric, quantitative assessment. Up to 6 Brayden Pro’s can be connected to 1 device allowing for simultaneous training and assessment. Records can be stored and easily exported via Email for easy analysis on your Spreadsheet program. Real time feedback helps the student to perform compressions at the correct depth, rate and recoil – and do so consistently throughout CPR! Brayden Pro provides multiple debriefing opportunities to help improve CPR performance, and real time feedback as CPR is being performed. 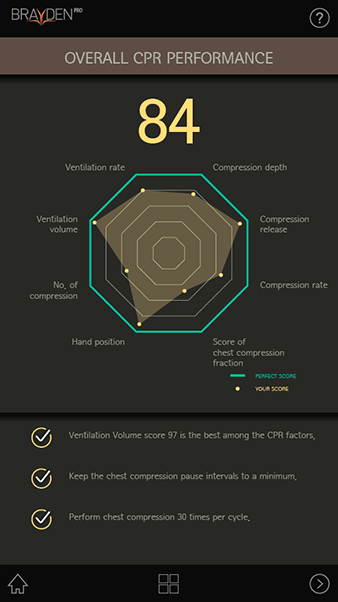 Provides a numeric score and pictorial summary of each CPR parameter measured against a theoretical perfect scores to highlight improvement needs. Presents detailed quantitative analysis for all relevant CPR metrics to provide an in-depth summary of performance. Identifies performance over time and associated effect on CPR quality. 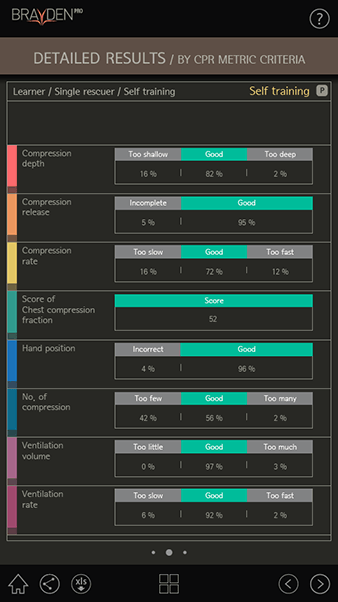 Provides relevant information for each measured CPR parameter to help improve performance. 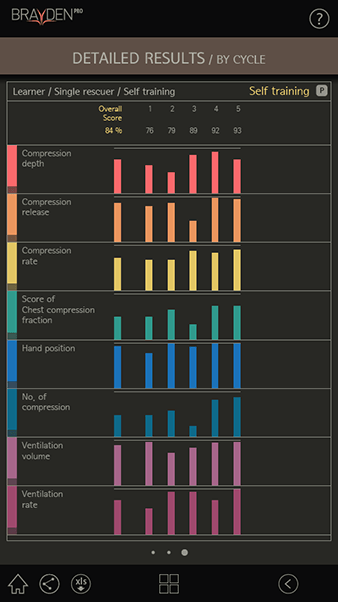 Provides an analysis of CPR performance for each measured CPR parameter for each cycle of CPR performed. Detailed in-depth below, this mode provides shows exactly what is happening in real-time during CPR. When both compression rate and compression depth are correct, a green circle appears. The bottom bar illuminates green when chest compression depth is correct. top - red when chest compression is not released properly. bottom - red when chest compression is too deep. left - yellow when chest compression rate is too slow. right - red when chest compression rate is too fast. Allows all chest compressions per cycle to be viewed to encourage consistent and correct compressions. By plotting Chest compression Depth Range (Y axis) against Chest Compression Rate Range (X axis) the accumulated chest compressions by cycle are displayed. The center square is the acceptable zone, with consistancy shown by well-grouped dots. Recoil of compressions per cycle are displayed by indicators at the top of the graph. 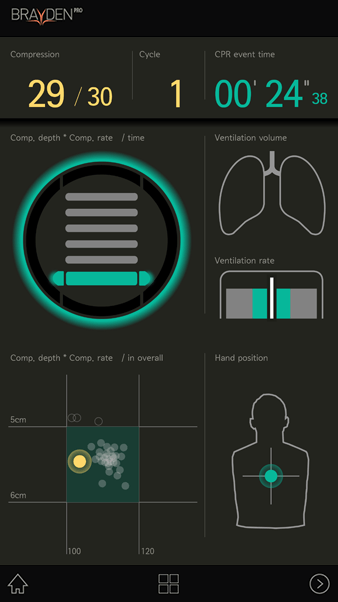 Allows real time real time feedback of ventilation performance with regard to correct volume of air delivered. Insufficient Ventilation volume - the lungs partialy fill with grey. Correct Ventilation volume - the lungs half fill with green. Excessive Ventilation volume - the lungs completely fill with red. Provides real time feedback of ventilation performance with regard to the correct rate of ventilations delivered. Provides real time feedback of hand position and provides a red-light indication when hand position is incorrect. These LEDs on the chest, neck and head of the Manikin represent the flow of blood from the heart towards the brain. The LED illumination varies according to the depth, speed and recoil of compressions, only fully animating when CPR is being performed correctly within parameters. The Brayden Pro app uses key CPR parameters set out in the American Heart Association Guidelines 2015 and the European Resuscitation Guidelines 2015. These can be adjusted in the App if the Guidelines change in the future. The parameters can also be weighted to take the student's experience into account, adjusting for lay responders and healthcare professionals. Watch the full video now and on YouTube to see the Brayden Pro Manikin and the Brayden Pro App in action! The Brayden Pro is the next logical step building on the success of the Brayden CPR Manikin range. Just as with the Brayden LED CPR Manikin, the Brayden Pro also features a sophisticated ventilation system for teaching CPR Rescue Breaths hygienically, with allergy-free materials and disposable lungs to ensure your students are comfortable and able to commit fully to your CPR training course. Realistic neck, nose and chest movements enhance the visual learning process. Head tilt and chin lift opens airways, with accurate Oral and Nasal passages and a realistic nose pinch. Brayden Pro is compatible with Oxygen Masks and disposable CPR Face Shields. Air from Brayden Pro's disposable lungs is vented through the back of its head, ensuring students never come into contact with exhaled air - reducing the risk of cross-contamination. Anatomically correct chest that rises and falls realistically as air enters and leaves Brayden's disposable lungs. Harmless, latex-free skin is easy to clean - and defibrillator pads are easily removed. RoHS & REACH compliant. Aero Healthcare is a global manufacturer and distributor of high quality First Aid Products and Training Supplies, with our Wound Care products and Public Access AEDs prominent in the medical and consumer healthcare sectors.